For Kati Garrido, animals have always been "family." While growing up in Mexico City, Kati had that rare sort of mother who let her keep all her dogs, geese, ducks, and chickens in the house. Even Kati's goat learned how to be an outdoor/indoor pet. As an adult in Los Angeles, Kati's life changed the day she came across Teddy, a pitbull on the street that had been hit by a car. She learned then that he would most likely be put down at the shelters if she left him there. Kati decided to find out why. Through her research, Kati learned about how many pitbulls get killed in shelters due to overpopulation and the negative stereotypes about the breed. 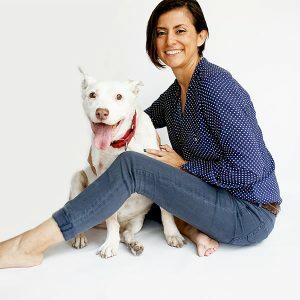 She became a committed volunteer with Karma Rescue so she could help educate people about the importance of spaying and neutering, and so she could help more pitbulls find homes. While volunteering, Kati fell in love with her beautiful, enormous white pittie Bunny Boo, with whom she has shared a home now for almost a decade. Kati has made it her life work to continue to work on behalf of animals. She currently serves as Director of Operations for Paws For Life. She aspires to share the sad truth about animals dying in shelters with as many people as she can. Although it is hard work, being part of a dedicated team and seeing dogs united with loving homes makes her feel that the struggle is worth it. Since childhood, Kati knew that animals were family; now she aspires to make room in more families for the thousands of dogs who need a home!